A Closer Look at Our Essential Oil Producers – The Citrus Harvest, Southern Italy - Amphora Aromatics Ltd – Supplier of pure essential oils and aromatherapy Products. and transformed into our Lemon, Mandarin and Orange essential oils. Using cold press extraction methods, our producers rely on the knowledge handed down over three generations. Their commitment to quality is evident from planting through to production. They have the ‘productive capacity to transform about three tons of fruit per hour’. It’s no surprise these oils are some of our bestsellers. Citrus aromas have been used over the centuries because they are fresh and sweet and offer us uplifting qualities. The Lemons harvested for our essential oil benefit from the warm Mediterranean climate. As a result, the production of fruit is almost uninterrupted throughout the year. The first harvest typically takes place in October and subsequently in March and June. The fruit peel is cold pressed to extract the pure oil, which is pale to deep yellow or greenish yellow. Similar to fresh lemon rinds except richer and more concentrated, with a crisp and fresh aroma. Approximately 3,000 lemons are required to produce a kilo of essence. Three variations of mandarin are harvested for oils from the Citrus Reticulata Blanco tree – Green, Yellow and Red. 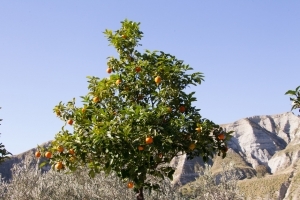 At Amphora, we source the contrasting Green and Red Mandarin oils. The aromas differ due to the time the fruit is processed in the “Pelatrici” - fruit peeling machine. Green= harvested in September and October - has a slightly livelier and younger note to the aroma. Red= typically harvested in January – provides a more mature, sweeter and smoother aroma. A familiar and refreshing scent - Oranges, from the Citrus Sinensis, are first harvested in November and can sometimes be picked as late April to create sweet smelling essential oils. Once harvested, the fruit will undergo the same cold press extraction method as the lemon and mandarin. The volatile oil obtained by expression from the fresh peel of the ripe fruit of the sweet orange is fresh and energising, perfect for room fragrancing. Keep an eye out for the next essential oil producer story in the New Year!